Catherine Ashton's initiative would blacklist Hizbullah’s so-called “military wing” while talking with its political faction. 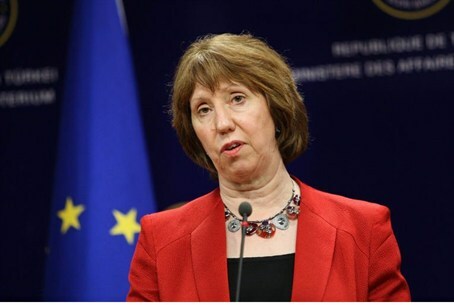 The European Union’s foreign policy chief, Catherine Ashton, is working on an initiative that would blacklist Hizbullah’s so-called “military wing” while leaving the EU open to talking with its political faction, EU diplomats said on Wednesday. EU ambassadors are set to discuss on Thursday the issue of adding Hizbullah to its list of terrorist groups. Counter-terrorist experts from the bloc's 28 member states twice failed last month to reach a unanimous decision to blacklist the Lebanese Shiite group. Two EU diplomats told Reuters on Wednesday that the proposal by Ashton suggests including a statement the EU "should continue dialogue with all political parties in Lebanon" and maintain funding to Beirut. "The proposal on the table makes it clear the EU is serious about responding to terrorist attacks on its soil," a diplomat, from a country in favor of blacklisting Hizbullah, said. A spokeswoman for Ashton said, meanwhile, that no decisions had been taken regarding Hizbullah. "Discussions are ongoing and any decision would need unanimity," Maja Kocijancic said. EU diplomats said this week that Austria, the Czech Republic, Ireland, Malta and Slovakia had not signed on so far to a push led by Britain, France and the Netherlands to blacklist the group. Concerns over Hizbullah have mounted in Europe since an attack last year on Israeli tourists in Bulgaria which Sofia blamed on the group. In March, a Cyprus court sentenced a Hizbullah member to four years behind bars for planning attacks there. Hizbullah’s growing involvement in the Syrian conflict in recent months has further worried EU nations. At the same time, many view Hizbullah as a legitimate political party in Lebanon.